There is a wax museum in Korean Life Insurance 63 City Building. The name of this wax museum is 63 Wax Museum. It's located on basement 3 of Korean Life Insurance 63 City Building. 63 Wax Museum is composed of several exhibition halls including Hall of Artists, Hall of Musicians, Hall of Sports Stars, Hall of Movie Stars, Hall of Last Supper, Hall of Historical Figures and Hall of Former Korean National Leaders. Among the exhibits are the wax figures of Gandhi, Einstein, Beethoven, King Sejong, Jesus Christ, Elvis Presley, Pablo Picasso, Michael Jackson and David Beckham. 63 Wax Museum is widely known in South Korea. During holidays and weekends, 63 Wax Museum will be flocked with visitors. This wax museum is opened on July 3, 2009. The admission fees are 14000 Won for adults and 13000 Won for children. Foreign Tourists are entitled for 1000 Won discount for both adults and children. The opening hours are from 10 am to 10 pm. The last entry is half an hour before the wax museum closes. For the transportation to 63 Wax Museum, feel free to read through my previous post. 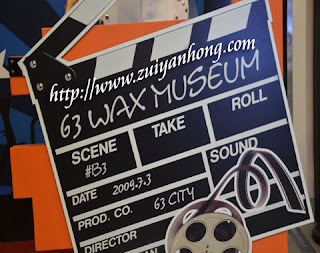 I will write about some of the wax figures which are displayed in 63 Wax Museum in my next article. Located at Yeouido Island of Seoul, Korean Life Insurance 63 City Building is one of the tall skyscrapers in South Korea. Korean Life Insurance 63 City Building is commonly known as 63 City in Seoul. Korean Life Insurance 63 City Building is a distinguished landmark at Yeouido Island in Yeongdeungpogu. The height of Korean Life Insurance 63 City Building is 249 meters and 63 stories. It was completed in 1985. There is an observation deck on 63rd floor. Visitors can enjoy watching the spectacular view of Seoul. The renowned Sky Cafe is on 60th floor. You can have snacks and refreshing drinks there. Walking in the Cloud is a restaurant on 59th floor. This restaurant provides delicious European dining. 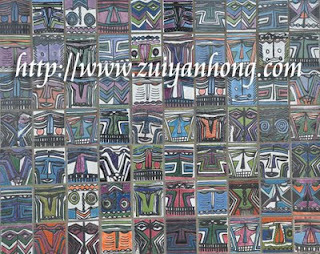 Sky Art is an art museum situated on 60th floor. It seems to be the highest art museum in the world. 63 Sea World is an aquarium which possesses more than 20000 fishes. In case you like to watch wide screen movie, you should drop in 63 IMAX Theater. A Wax Museum is also available in Korean Life Insurance 63 City Building. Getting to Korean Life Insurance 63 City Building, line 1 and line 5 subways will bring you there. If you take line 1 subway, get off at Daebang Station. Get off at Yeouido Station and Yeouinaru Station if you take line 5 subway. Free shuttles are provided from these subway stations to Korean Life Insurance 63 City Building. The tall buildings in this photo are South Korea LG Twin Towers. 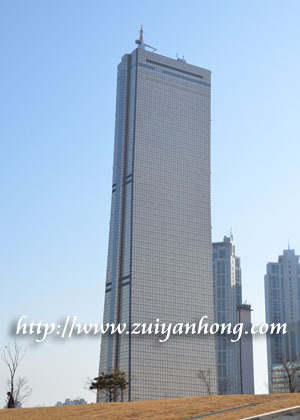 LG Twin Towers are located in Yeouido which is known as Manhattan of Seoul. 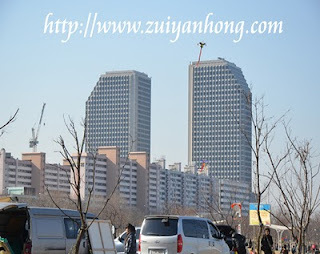 Among the landmarks in Yeouido are LG Twin Towers, National Assembly Building, Korean Life Insurance 63 Building, Seoul Broadcasting System, Korean Broadcasting System, and Munhwa Broadcasting System. The height of LG Twin Towers is 144 meters and 34 stories. Getting to LG Twin Towers is truly convenient. You can take line 5 subway and get off at Yeouinaru Station. Come out from exit 1, LG Twin Towers will appear in front of you. There are many festival events available all year round in Yeouido Hangang Park of Seoul. 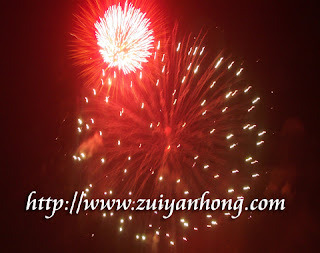 Firework Festival is one of the exciting events. It's normally held in autumn. Foreign tourists will flock to the venue of the Firework Festival to experience to exotic celebration in South Korea. Seoul residents also rush to Yeouido Hangang Park to watch the gorgeous firework. This photo was taken when I was taking a river cruise in Seoul of South Korea. The building in the photo is South Korea National Assembly Building. It's the venue of Republic Of Korea National Legislative Assembly. 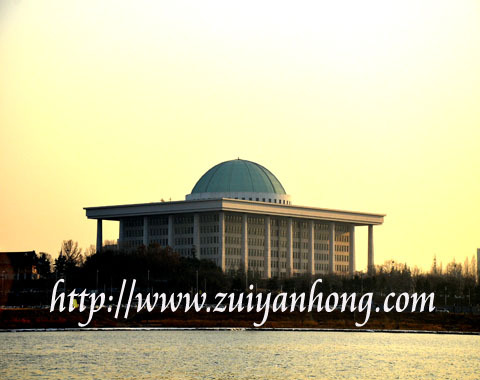 The National Assembly Building is located on the bank of Hangang in Yeouido Hangang Park. The building was constructed in 1975. The structure of this building is truly unique. Do you think it looks like an Islamic mosque? There are total of 27 bridges stretched across Hangang which flows through Seoul of South Korea. Yeouido Hangang Park Wonhyogyo is one of the bridges. What so special about this Korean bridge? Wonhyogyo will be seriously jammed during rush hour. Some of the bridge pillars are pasted with colourful artistic ceramic tiles. It is a location where tourists like to take photos. If you are keen of fishing, remember to bring along fishing tackle when you are dropping by Hangang Park. 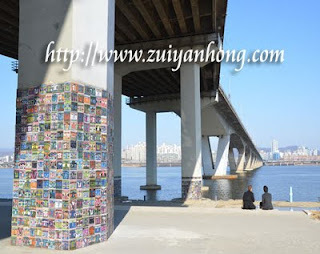 Beyond that, visitors of Hangang Park can sit under the bridge to enjoy the invincible river view.